"Rich and gooey, a little slice is all you'll need." In a saucepan over medium low heat melt the milk chocolate covered caramel and nougat candy bars and 1/2 cup of the butter or margarine, set aside. Cream 2 cups of the white sugar and 1/2 cup of the butter or margarine together until light and fluffy. Beat in eggs one at time, mixing well after each one. Combine the flour and the baking soda. Add alternately with the buttermilk to the egg mixture. Stir in the melted candy mixture and the pecans. Pour batter into the prepared pan. Bake at 325 degrees F (165 degrees C) for 1 hour and 10 minutes. Allow cake to cool then frost with Marshmallow Chocolate Icing. 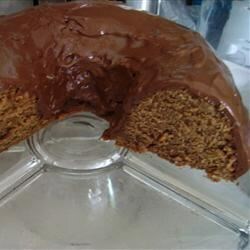 To Make Chocolate Marshmallow Icing: In a saucepan over medium heat cook the 2-1/2 cups white sugar and the evaporated milk to the soft ball stage 238 degrees F (114 degrees C). Stir in semi-sweet chocolate chips, 1/2 cup butter or margarine and the marshmallow cream. Stir until all are melted. Remove from heat and beat until cooled. Spoon over top of cooled cake. I made this for my husband to take to a plant dinner and everybody loved it!!! I got many requests for the recipe..Thanks!! I made this for my husband for his birthday and everyone really liked it. Snickers are one of his favorite candy bars, so I used those and left out the pecans. The frosting was his favorite part!